WinCatalog 2018 disk catalog maker indexes disks, files, and folders for finding files and data without having to reach for the original disk: Hard Disk, Pen Drive, Network Drive, CD, DVD, or other. Save your time using disk catalog maker WinCatalog! Stop wasting time looking for a file, archived document, or a digital photo, stored on hundreds disks from your growing disk catalog! Simply process your disks with WinCatalog once, make a catalog of your disks, organize it, using tags and virtual folders, and use powerful search for finding files from your disk catalog instantly! Peter Huber "Excellent software! Thank you for sticking to conventional look & feel as much as possible, it makes the program very intuitive to use. Also, the nested virtual folders alone are worth the money - no one else seems to understand or implement this feature correctly." James Lohman "By the way - fantastic program. I had used WinCatalog Light years ago. Now bought copies of Pro for myself and my wife for work and pleasure. Having cataloged old drives I have been able to easily find things I had long forgotten." WinCatalog 2018 is database driven. It uses the industry standard SQLite database engine in the core. This helps to operate with catalogs of any size. No matter how many disks, files, or folders are stored in your catalog – WinCatalog 2018 will handle all of them! 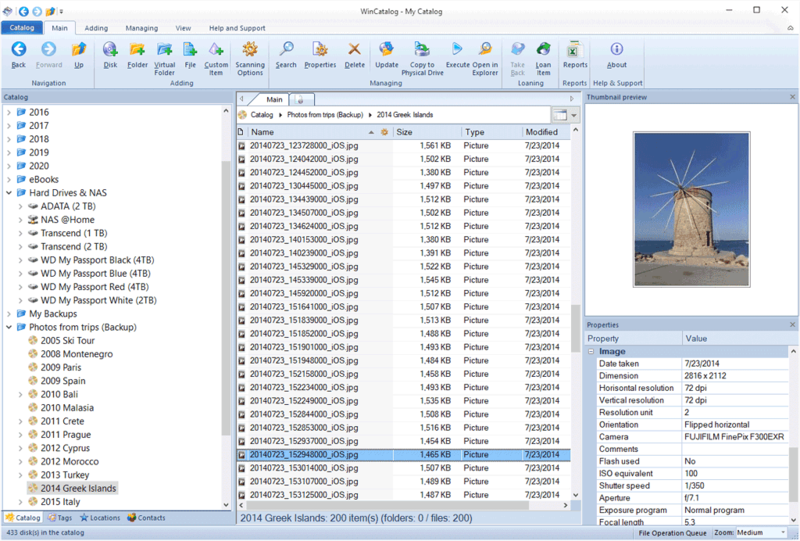 WinCatalog 2018 can create picture thumbnails for most popular image types (like jpeg, png, bmp, and others) and store them inside the catalog. The thumbnail previews are available even without the link to the original files, so if you search for a photo or picture, you can preview it BEFORE reaching the disk! The thumbnails preview picture can be associated with ANY item in the catalog (not only with picture files). For example, you can create a catalog of your postal stamp, coin, or teddy bear collections and every collected item will have its own picture! WinCatalog 2018 fully supports Unicode. No matter in what language your disks, files, and folders are named. WinCatalog 2018 will correctly catalog all of them. In addition to Contact manager and Keyword manager, WinCatalog 2018 has a new Location manager that helps to manage physical locations easier. You can add all locations, say “box 1” or “cd wallet 2” and associate every item in the catalog with the location. This will help in finding things faster. WinCatalog 2018 has a tabbed interface that allows you to keep several various search results simultaneously.